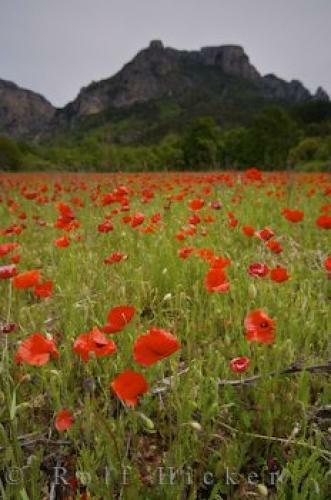 The cliffs of Gorges du Verdon tower above a field of wild red poppies in the Alpes de Haute, Provence, France. The sides of the road are alight - bright red where the wild poppies grow! Backdropped by rugged, mammoth, towering cliffs of rock, while waving gracefully in the light breeze. A scene, such as a field ablaze with wild poppies is a hard one to resist, inducing one to take the time to enjoy the view and chance to photograph. It's like a red carpet extending out in front of you. Each unique poppy bloom owns its stem and lifts its head just before blooming, revealing its heart to the elements. Field of Poppies backdropped by the cliffs of Gorges du Verdon near Moustiers Ste Marie, Alpes de Haute, Provence, France, Europe.